Herstel vergeten softwaresleutels of inloggegevens! 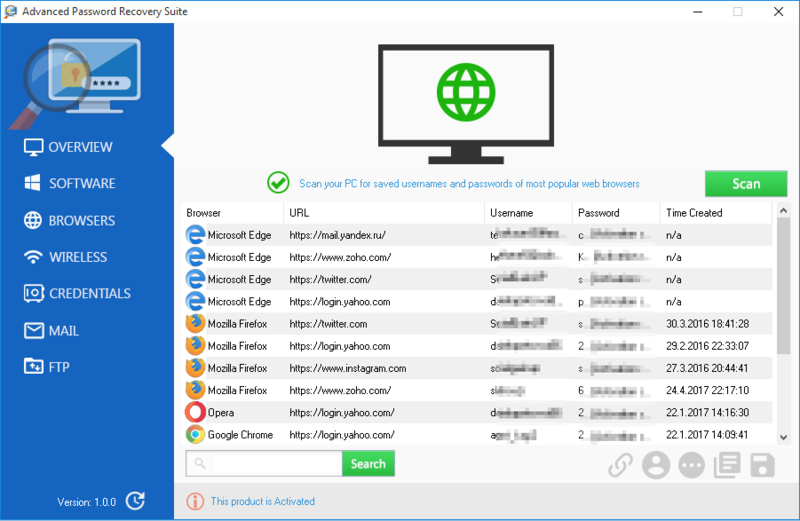 Advanced Password Recovery Suite is een eenvoudig te gebruikentool met de mogelijkheid jouw vergeten softwaresleutels of inloggegevens te herstellen voor de meeste populaire webbrowsers, draadloze netwerken, Windows Credential Manager, E-Mail of FTP-clients. Herstel sleutels voor Microsoft Windows en Office, Nero, WinZip en meer dan 1500 andere software en games..
Herstel gebruikersnamen en wachtwoorden voor Google Chrome, Microsoft Edge, Mozilla Firefox, Internet Explorer, Vivaldi of Yandex. Herstel draadloze netwerksleutels (WEP, WPA en WPA2) voor alle eerder gebruikte draadloze netwerken. Herstel inloggegevens opgeslagen door de Windows Credential Manager. Herstel gebruikersnamen en wachtwoorden voor de meeste populaire e-mailclients zoals Outlook, Thunderbird en Opera Mail. 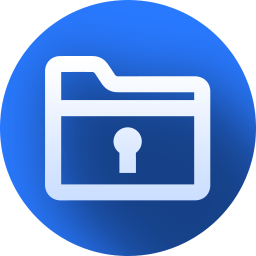 Herstel inloggegevens voor gebruikte FTP client zoals FileZilla, WinSCP en SmartFTP. Opmerking: deze aanbieding beschikt over eens 6 maand licentie! 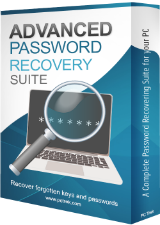 "Advanced Password Recovery Suite 1.0.4"
Dit programma is twee keer eerder aangeboden in een competitie. Seems okay, I got loads of password and license references from the registry, but it's a shame that it has no smarts to look elsewhere, it locked when searching browsers, I killed it and restarted, then it got browser passwords fine, I saved text files of each search so I now have a historical reference to help me find passwords and licenses for later re-use. I see nothing special or better than the exceptional free NirSoft utilities, except maybe adding a GUI graphic user interface collecting various searches into a single on-screen group ( note: independent folks have sort of done a GUI for NirSoft's separate utilities ). This does not seem to collect login in information, so if you have a user account with an unknown password, or off-line drive where accounts have a password unknown to you, this does not seem to offer any services to get those passwords -- we still need to reboot into someone else's Linux CD/USB and get those ourselves. When I see a title like "Password Recover SUITE" that is missing essential password recovery capability, I think the vendor has either missad a great opportunity to really offer an all-in-one collection, or it's just marketing whooey, and the vendor is nothing more than advertising copywriters, not programmers. Another opportunity missed is to search the web for matching sign-in names and passwords that have been compromised so users know what to CHANGE. All in all, an immature offering in an age where intelligent sophistication is absolutely essential.
. Seems okay, I got loads of password and license references from the registry, but it's a shame that it has no smarts to look elsewhere, it locked when searching browsers, I killed it and restarted, then it got browser passwords fine, I saved text files of each search so I now have a historical reference to help me find passwords and licenses for later re-use. I see nothing special or better than the exceptional free NirSoft utilities, except maybe adding a GUI graphic user interface collecting various searches into a single on-screen group ( note: independent folks have sort of done a GUI for NirSoft's separate utilities ). This does not seem to collect login in information, so if you have a user account with an unknown password, or off-line drive where accounts have a password unknown to you, this does not seem to offer any services to get those passwords -- we still need to reboot into someone else's Linux CD/USB and get those ourselves. 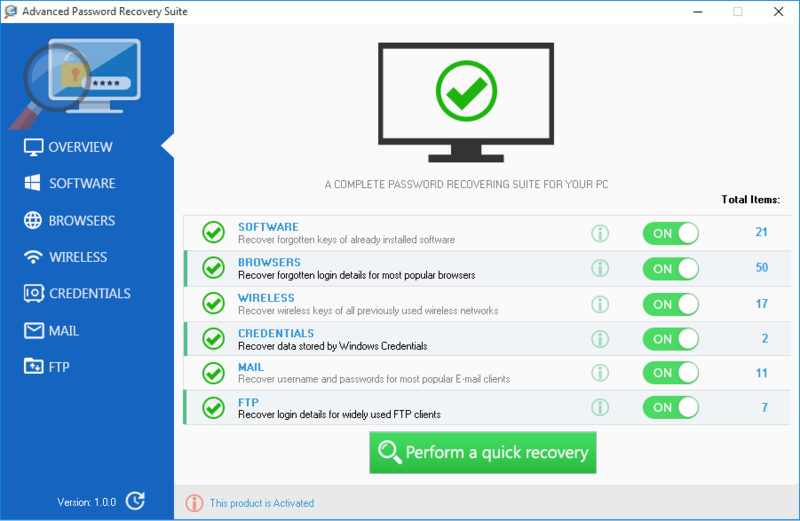 When I see a title like "Password Recover SUITE" that is missing essential password recovery capability, I think the vendor has either missad a great opportunity to really offer an all-in-one collection, or it's just marketing whooey, and the vendor is nothing more than advertising copywriters, not programmers. Another opportunity missed is to search the web for matching sign-in names and passwords that have been compromised so users know what to CHANGE. All in all, an immature offering in an age where intelligent sophistication is absolutely essential. . Doesn't worked on my Win 7 pro pc. Everytime when i tried to scan passwords it crashed. Doesn't worked on my Win 7 pro pc. Everytime when i tried to scan passwords it crashed. Removed and thumbs down. Edgar, If you get a reply and I found such software exists I would immediately stop using TrueCrypt.